The iPad runs on the iOS platform, which is one of the most secure operating systems in use today. But Wirelurker, which installs malware onto your iPad when you connect it to an infected computer running Mac OS, and more recently, a variant that does essentially the same thing through email and text messages prove that even the most secure platforms aren't 100 percent safe. So how do you protect yourself from malware and viruses infecting your iPad? With a few guidelines, you should be covered. Both of the recent exploits are very similar in how they infect your iPad. They use the enterprise model, which allows a company to install their own apps on the iPad or iPhone without going through the App Store process. In the case of Wirelurker, the iPad must be physically connected to a Mac via the Lightning connector and the Mac must be infected with Wirelurker, which happens when the Mac downloads infected apps from a third-party apps store. The newest exploit is a bit trickier. It uses text messages and emails to push the app directly to your iPad without the need for it to be connected to a Mac. It uses the same enterprise "loophole." For this to work wirelessly, the exploit must use a valid enterprise certificate, which isn't easy to obtain. Luckily, you can protect yourself against these and other intrusions. Most apps are installed via the Apple App Store, which has an approval process that checks for malware. For malware to get onto your iPad, it must find its way onto the device through some other means. 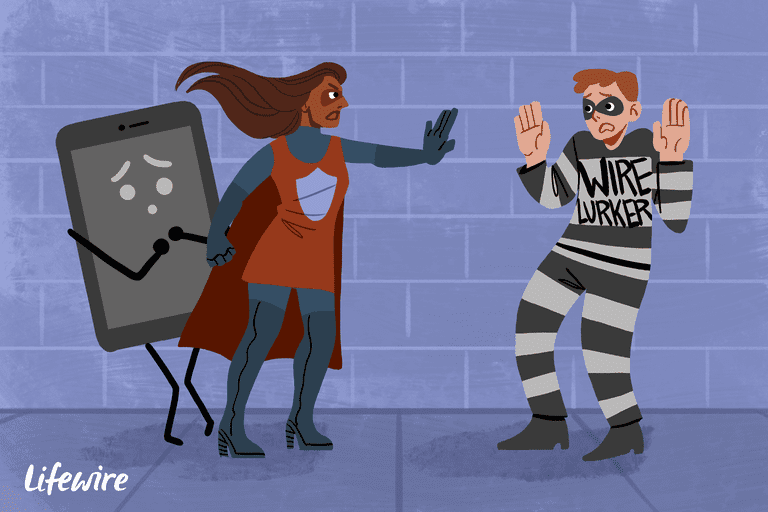 First, think twice about jailbreaking your device. One way malware can be installed on your iPad is by side-stepping Apple's App Store. Knowledgeable users can jailbreak their device and research individual apps to reduce the threat of malware, but even then, they are in a less protected environment. If you are looking for the best protection, simply avoid jailbreaking the iPad. Next, always install the latest updates. Hackers are good at what they do, and they are continuously checking all facets of the iPad for a way into the device. Apple combats this by patching holes and releasing those patches as operating system updates. Never trust an unknown computer. When you plug your iPad into a PC via the Lightning adapter, you will be prompted on whether or not to trust the computer. Your iPad will charge regardless of your answer, and the only reason to trust a PC is to transfer files. With the ability to back your apps and data up to the cloud and restore backups from the cloud, you can even avoid plugging the iPad into your own PC. Never give permission for an app to be installed on your device. This is where they get you. The "loophole" of the enterprise model isn't so much of a loophole as it is a feature being repurposed. No doubt, Apple will make it tougher for hackers to use this method in the future, but there will always be a way for corporate apps to be installed ​on an iPad. When this happens, your iPad prompts you for permission to install the app. Any time you get a strange prompt from your iPad, decline it. And if you are asked to install an app, definitely decline it. When you download an app from the App Store, you are asked for your Apple ID, but not asked specifically for permission to install the app. In addition to these steps, you should make sure your home Wi-Fi network is properly protected with a password. As much as the word "virus" has put a scare into the PC world for a couple of decades, there's actually no need to worry about protecting your iPad. The way the iOS platform works is to put a barrier between apps, which prevents one app from modifying the files of another app. This keeps a virus from being able to spread onto an iPad. There are a few apps that claim to protect your iPad from viruses, but they tend to scan for malware. And they don't even concentrate on apps. Instead, they scan Word documents, Excel spreadsheets and similar files for any potential viruses or malware that can't actually infect your iPad, but could potentially infect your PC if you transfer the file to your PC. A better tactic than downloading one of these apps is to simply make sure your PC has some type of malware and virus protection. That's where you need it, after all.